With margins being squeezed across dealerships – most recently across finance and insurance – success is increasingly focused on winning the used car battle. With 2M-plus used cars sold every year in Australia – double the new car market – healthy profits at decent scale are still available for dealerships. That said, the competition is fierce and fewer obvious competitive advantages exist, with many areas of marketing and promotion reaching saturation. Enter Australia’s newest used inventory solutions: Facebook Marketplace and Facebook’s Dynamic Ads for Automotive (DAA). Whilst many Dealers already use Facebook in a variety of ways to drive business outcomes, the latest innovations from Facebook are tried and tested strategies at flipping inventory across your used car portfolio. Both Marketplace and DAA have been live across North America for 12-plus months and are proving incredibly effective at delivering measurable dealership sales. Given both solutions have just recently rolled out across Australia, first movers will benefit greatly. Here is what you need to know about the two products and how to get started. Marketplace is an easy, convenient way to buy and sell on Facebook in your local area. You can look through listings or search for items near you to find great things, such as used cars, to buy. In fact, since the 2016 Marketplace launch in Australia vehicles have organically become a top category for Aussies to buy and sell. We’ve now opened up the ability for dealerships to pipe their used and demo inventory directly into this marketplace environment. communicate with select dealerships in real time via Facebook Messenger (or get a call back via lead form on individual listings). How can I list inventory? 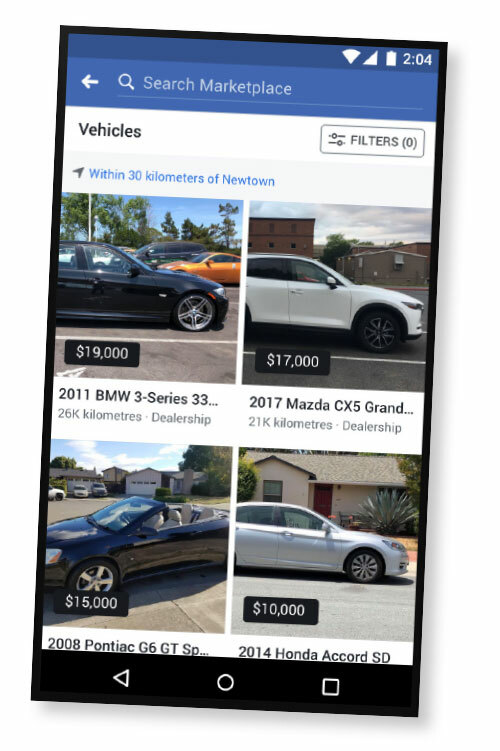 The automotive ecosystem in Australia now has the ability to directly pipe used car inventory feeds into Facebook Marketplace via our launch partners CarSales, Drive Network, AdTorque Edge, iMotor, AutoTrader, Dealer Solutions and EasyCars. These new partnerships improve the user experience with more volume and quality of inventory available across Marketplace. You’ll need to get in touch directly with any of the above partners to understand the specifics around how to get your inventory listed onto Marketplace. Dynamic Ads for Automotive are optimized for people who are in the market for a vehicle right now. These ads use your Facebook pixel to show ads to in-market shoppers including and beyond your recent website visitors. This no-brainer solution allows Dealers to upload their vehicle catalogue with relevant details such as make, model and year. It then automatically generates ads that show the most compelling inventory to the right audiences, driving them toward vehicle detail pages, lead submission forms or other high value destinations. Convenient one-time setup. Dynamic Ads for Automotive are automatic, efficient and adaptable – you only have to set up your campaign once to promote all of your inventory, without having to create each ad separately. Deliver ads to people who want to see them. With Dynamic Ads for Automotive, you can automatically serve up ads with real time availability and pricing to people based on vehicles they show intent to purchase. Reach people across devices. Your ads will appear on web and mobile regardless of the device they used to originally see your product. Your campaigns are always on. Your campaigns are automatically set to reach people with the right inventory at the right time, based on the actions they take on your website. How can I get started with Dynamic ads? Dynamic Ads are not possible to run without the Facebook pixel on your website. If you do nothing else after reading this article, make sure the Facebook pixel is added to your website as a priority. Without the pixel your dealership is at a massive disadvantage compared to those Dealers already tapping into its capabilities. The Facebook pixel is a short line of code that helps track and report on website activity and which should be installed on every page of your website. The pixel opens up advanced in-market targeting solutions, more intelligent media buying and better reporting capabilities sure to improve your marketing performance. Talk to your website developer to get the Facebook pixel implemented today. The dynamic ads technical setup and ongoing advertising maintenance is best outsourced to the Facebook partners well-trained in maximizing performance for your dealership and troubleshooting any speed bumps along the way. The Facebook preferred dealership agencies and technology partners are AdTorque Edge, McKenzie Partners, iMotor, Dealer Solutions, ClickMedia Solutions and Ignite Group. Get your Dynamic Ads running today with our partners. Start taking advantage of both product innovations across Facebook today. Dynamic Ads will help generate more exposure across in-market shoppers not currently considering your dealership. Marketplace will provide your inventory presence across a highly engaged shopper group already using the space to find their next car. This is just the beginning. Keep an eye out for more automotive-specific product innovations aimed at driving manufacturer and dealership-specific business challenges in 2019.